Mission style elegance is yours in the kitchen with a set of Amish Wabash Swivel Bar Stools. A contoured back supports you as you sit for meals, snacks or drinks. Kids will love this spot to sit and do homework at the kitchen counter. The Wabash Swivel Bar Stool is shown here in brown maple wood. Brown maple brings out the beauty in a dark stain with its magnificent chocolate and cherry tones. Stationary version of this bar stool: Amish Wabash Stationary Bar Stool. 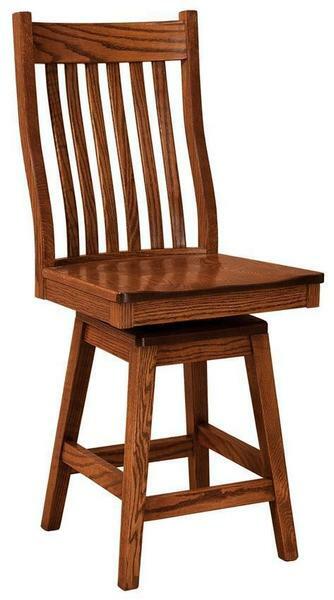 Find similar construction around your dining room table with our Amish Wabash Dining Chair. Enjoy our blog post, Beyond the Bar: Other Uses for Bar Stools for more ideas for custom bar stools throughout your home. Call today to begin your order. Our Amish Furniture Specialists are standing by to assist you at 866-272-6773.